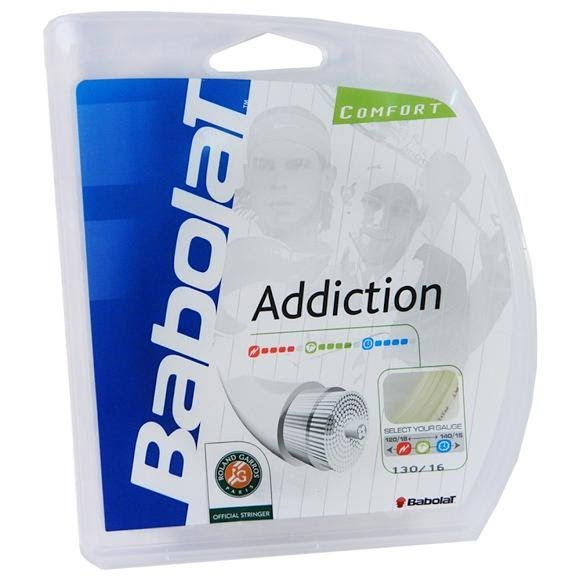 Babolat offers the perfect string for the tennis addict. This is Babolat's slightly firmer and more durable multifilament counterpart to XCel. Addiction is a nice choice for the player looking for power, comfort, and feel. However, it plays slightly firmer than its counterpart XCel, offering less power and a bit more control. Babolat offers the perfect string for the tennis addict. This is Babolat&apos;s slightly firmer and more durable multifilament counterpart to XCel. Addiction is a nice choice for the player looking for power, comfort, and feel. However, it plays slightly firmer than its counterpart XCel, offering less power and a bit more control. Durability is also enhanced with Polytetrafluorethylene, a low friction material included to reduce string notching and premature breakage. Our TW playtesters found some nice ball pocketing and a lively response from this string. This would be a great choice for the all-court player looking for the soft feel of a multifilament, but wanting a little more control and durability.